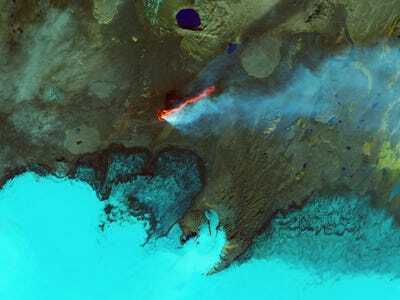 U.S. Geological Survey/Geoscience AustraliaLandsat 8 took this image of Western Australia in May 2013. The Landsat program involves a series of successive satellites that each take tens of thousands of pictures of Earth over their life time. The first Landsat satellite was launched into orbit in 1972, which makes the Landsat program the longest-running project to collect photos of Earth from space. 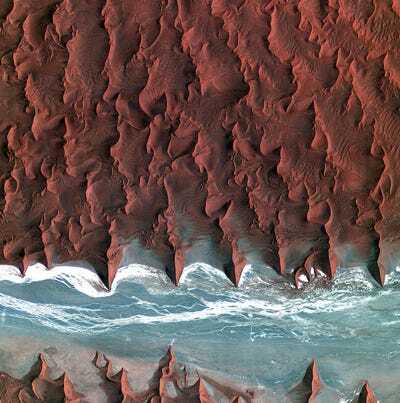 In total, the Landsat satellites have acquired millions of images of Earth that provide an unprecedented look at how the face of our planet is changing in recent decades. NASA launched the latest member of the team, Landsat 8, into orbit on February 11, 2013. With powerful cameras on board, Landsat 8 can resolve a region of Earth as small as 100 feet long. This means the satellite can take a clear picture of a baseball field, which is impressive considering the satellite orbits 438 miles above Earth’s surface. At this height Landsat 8 moves at about 4.7 miles per second and orbits Earth 15 times each day. Between Landsat 8 and the still-operational Landsat 7, the two satellites observe every spot on the globe at least once every eight days. 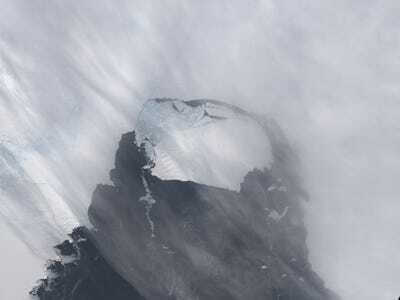 This glacial chunk has almost completely detached from the larger Antarctic Pine Island Glacier and is large enough to fit 8 Manhattan-sized cities on it. 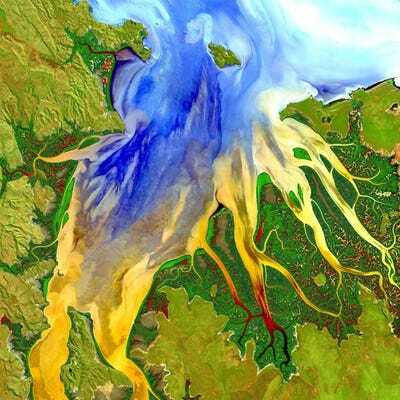 Landsat 8 took this image on Nov. 13, 2013. 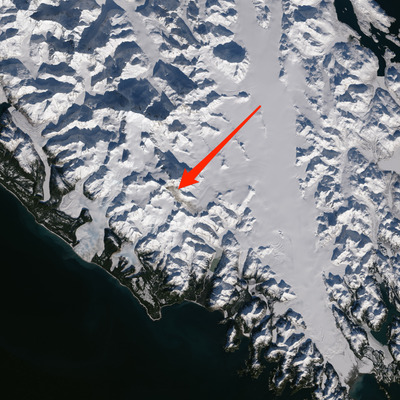 One of the largest landslides of this decade took place last February in southeastern Alaska. The landslide involved 68 million metric tons of material, and the aftermath is shown here by the brown streak smeared across the snowy background. 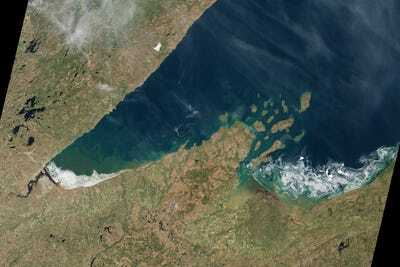 Landsat 8 took this image on Feb. 23, 2014. 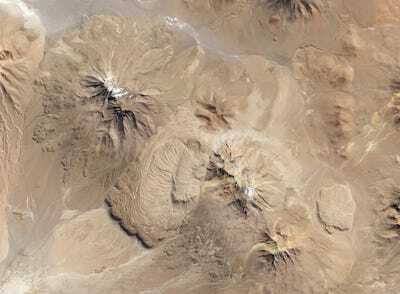 Between these two volcanoes in northern Chile is the Chao dacite, which is a type of lava dome with characteristic ripples that form when exceptionally thick, sticky lava flows onto a steep surface. Landsat 8 took this image on May 14, 2013. In spring, blue ponds speckle southwest Greenland as ice melts. The size and number of these ponds help track how much the ice sheet is melting each year. Landsat 8 took this image on June 21, 2013. 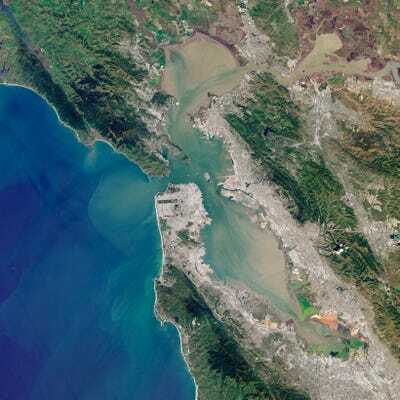 The upper, central pocket of water is the San Pablo Bay that connects to the San Francisco Bay to the south, which then feeds into the Pacific Ocean. You can clearly see how murky, muddy coastal waters make their way out to the surrounding ocean. 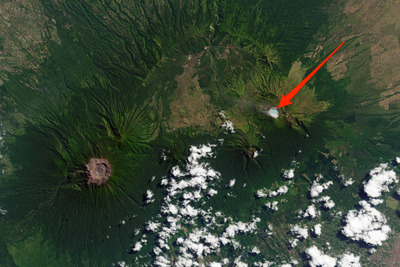 Landsat took this image on April 16, 2013. California's Mount Shasta is a popular place for skiing in the winter, but not this year. Limited snowfall meant only two to three inches on the slopes last January -- too little for skiing. Landsat 8 took this image on Jan. 4, 2014. 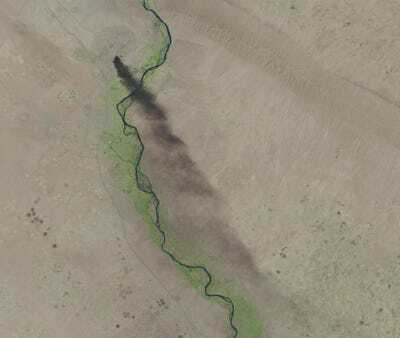 A black plume of smoke extends miles down from the largest oil refinery in Iraq, which was set on fire by insurgents who attacked the refinery earlier this year. Landsat 8 took this image on June 18, 2014. This false-coloured image taken last September shows fresh lava in red spewing from the Holuhraun lava field in Iceland. 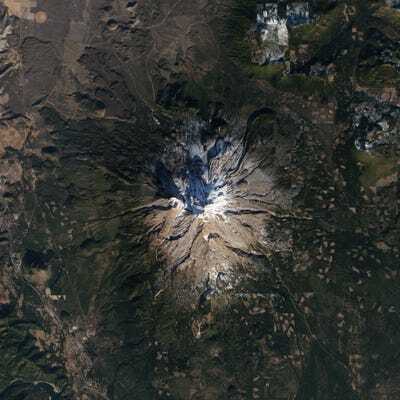 Landsat 8 took this image on Sep. 6, 2014. 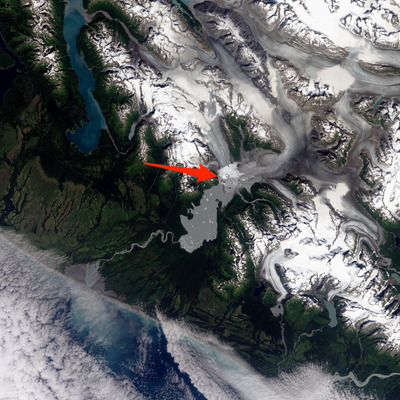 Harlequin Lake, sitting just south of the red arrow, boarders Yakutat glacier. Located in southeastern Alaska, Yakutat glacier is one of the world's fastest-retreating glaciers. 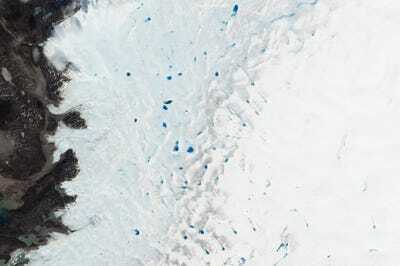 The red arrow shows the icebergs that form as the glacier melts and breaks apart. Landsat 8 took this image on Aug. 13, 2013. Beautiful swirls of ice decorate the edge of Lake Superior. Parts of the lake remained frozen as late as May of this year, when this image was taken of the region near Chequamegon Bay, Wisconsin. Landsat took this image May 23, 2014. Indicated here is the world's largest acidic lake, which fills a crater carved out at the summit of the Kawah Ijen volcano in Indonesia. The lake's bizarre turquoise shade comes from the hydrochloric and sulfuric acids that result from dissolved materials. The acidity of the lake is about five times stronger than battery acid. Landast 8 took this image on Aug. 22, 2013.